Buy New Nikon1 AW1 Mirrorless Digital Camera with 11-27.5mm Waterproof 15m, Shockproof 2m, Weatherproof -10degreesc (White) Free 8GB Malaysia At FotoZZoom! The Nikon 1 AW1 and matching 1 NIKKOR AW 11-27.5mm f/3.5-5.6 waterproof lens will quickly have you shooting on land or sea. The standard zoom range of the 1 NIKKOR AW 11-27.5mm f/3.5-5.6 will let you capture wide-angle landscapes, group shots, portraits and more. From black diamond slopes to tropical reefs to bustling city streets – count on the Nikon 1 AW1 for beautiful images wherever you go. It’s the world’s first* waterproof, dustproof and shockproof interchangeable lens camera. Rugged with a refined premium design, it’s the perfect companion from quiet moments to exhilarating adventures. Waterproof up to 15m. Dive right in. 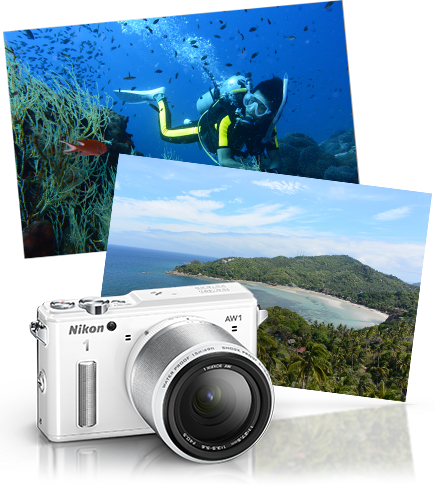 Discover the world of underwater photography with the Nikon 1 AW1’s waterproof capabilities. Featuring an Auto Distortion Control for correcting barrel and pin cushion distortion, the Nikon 1 AW1 lets you explore depths of up to 15 metres and capture images in exquisite detail all the way. Its built-in pop-up flash also delivers stunning images even in the darks of the water. Take your underwater photography to new heights with any of the two waterproof lenses that are designed to complement the new Nikon 1 AW1. 2m shockproof. Enjoy adventures with peace of mind. The Nikon 1 AW1 is built for action. It is fully dustproof and can survive falls from as high as 2 metres. The Nikon 1 AW1 features a built-in electronic compass and a host of other gauges. So while you’re exploring the world, you can easily log your travels by saving information including GPS location, altitude, direction and more to your images. Performance at -10ºC. Dash through the snow. The Nikon 1 AW1 is your perfect companion when it comes to icy adventures. Controls are designed for easy access with gloves on. For quick one-hand operation, the innovative Action Control allows you to access assigned functions by simply tilting the camera. Exceptional imaging performance. Capture every moment. Equipped with a 14.2-megapixel CX-format CMOS sensor, the Nikon 1 AW1 offers superior image quality even in dimly-lit surroundings with its ISO range of 160- 6400. Its Advanced Hybrid Autofocus System also combines the best of phase-detection and contrast-detection to provide you with the optimal focus speed and accuracy for photos and videos. For quicker image processing on-the-go, the Nikon 1 AW1 is equipped with the EXPEED 3A image-processing engine and also comes with a selection of special photo editing effects. Coupled with its 15fps continuous shooting feature, you will never miss a precious moment again. Sleek luxury design. Step out in style. With its premium metallic exterior, the Nikon 1 AW1 is designed with style in mind. The 3-inch monitor offers high resolution (approximately 921k-dot) and contrast to deliver sharp details both indoors or outdoors. The Nikon 1 AW1 comes in leather-tone black, lustre white and stainless-steel silver. Create breathtaking videos in HD. Above and underwater. The Nikon 1 AW1 gives you the freedom to capture gorgeous videos in any environment – all in 1080p full HD. Add a splash of dramatic effects to your videos by recording them in slow-motion. The Nikon 1 AW1 also enables you to capture still images without interfering with movie recording. A host of extensions. Limitless possibilities. The Nikon 1 system opens up a world of creative possibilities. The camera is compatible with all existing 1 NIKKOR lenses and a range of accessories. In addition, the two new all-environment lenses, 1 NIKKOR AW 11-27.5mm f3.5-5.6 and 1 NIKKOR AW 10mm f2.8, have been specially designed for the Nikon 1 AW1. For more natural lighting, pair it with the LED Light LD-1000 that offers continuous illumination. * Among digital cameras with interchangeable lenses available as of September 19, 2013. Statement based on Nikon research. A dedicated : Tough, versatile waterproof and shockproof lenses, made specially for Nikon 1 AW1. A ruggedly stylish camera deserves an equally rugged lens. Nikon gives : The 1 NIKKOR AW 11-27.5mm f/3.5-5.6 zoom lens which is shockproof from drops as high as 2 m (6.6 ft)* and feature waterproof performance down to 15 m (49 ft)† for the zoom lens. Finished with a luxurious metallic exterior that coordinates seamlessly with the body, this lens cover nearly any scene, from landscapes and city streets to intimate portraits and special occasions both formal and fun. HD movies (aspect ratio 16 : 9) 1920 x 1080/60i (59.94 fields/s*) 1920 x 1080/30p (29.97 fps) 1280 x 720/60p (59.94 fps) 1280 x 720/30p (29.97 fps) Slow-motion movies (aspect ratio 8 : 3) 640 x 240/400 fps (plays at 30p/29.97 fps) 320 x 120/1200 fps (plays at 30p/29.97 fps) Motion Snapshot (aspect ratio 16 : 9) 1920 x 1080/60p (59.94 fps) (plays at 24p/23.976 fps) * Sensor output is about 60 fps.